Now you can delete logged time records. Now you can have projects with the same short name in different areas. We've fixed passing ownership of an area to another person. We've fixed the alignment of long tag names. Turning on “Show Guide” once again caused issues during project creation. It doesn't anymore! Tags shift in the list when the assignment is removed in details. Now they stay in place. We've taken care of the occasional cycled page refreshing when the app was open in the browser for a long time. Long task notes are now correctly shown in the task info panel. 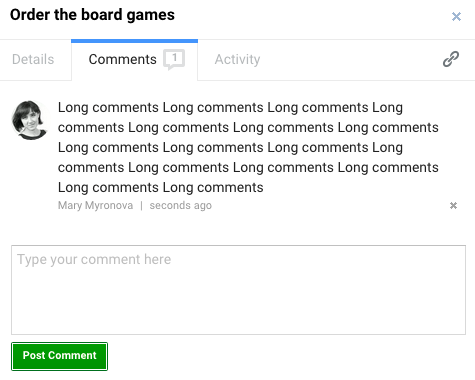 Long comments are now correctly aligned in the comments panel.